"After our meeting, I will hold consultations with the leaders of the countries that I have just mentioned". "Vladimir Putin informed Donald Trump of the main results of a meeting with Bashar al-Assad that took place on November 20 at which the Syrian leader confirmed his commitment to the political process, (and) conducting constitutional reform and presidential and parliamentary elections", the Kremlin said. Mr Assad, who has only ventured outside Syria twice since the conflict began, both times to Russian Federation, thanked the country and its leader for helping to "save our country". It's the first time the two leaders have met since October 2015, just a month after Russian Federation came to the aid of the embattled dictator with a series of airstrikes against rebels opposing Assad's regime. Putin hosted Assad at a Black Sea resort ahead of a summit later this week with Russia, Turkey and Iran, the ABC reported. 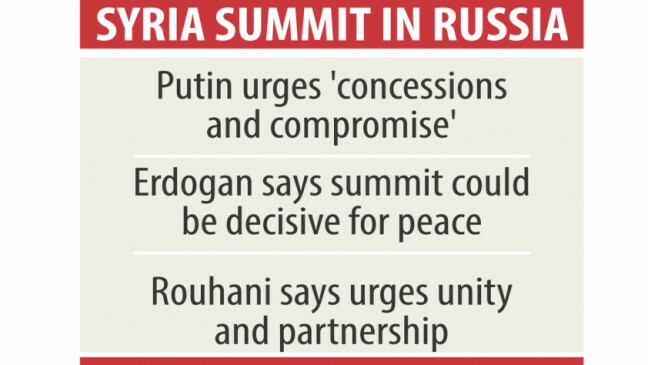 With the Syrian government controlling most of the country and Islamic State (IS) fighters in disarray, Mr Putin told Mr Assad at the Monday meeting that Moscow is about to curtail its military presence there. This week's visit is the second time Assad ventured outside his war-ravaged nation since the civil war began, both times to Russian Federation. Putin and his government have been one of the chief supporters of the Syrian President's government, both militarily and in helping negotiate ceasefires in the country's long-running civil war. "We should admit that the operation allowed to move forward the political settlement in Syria", he noted. We expect to end the fight against terrorism in Syria soon, said Putin, who acknowledged that there will always be pockets of resistance by the extremists against which it will be necessary to fight.